Most new ranch owners in the west made their money elsewhere and buy ranches more for their trout and elk than for their cattle raising capabilities. As property values rise ranching, already a marginal business, simply becomes economically unsustainable. While I cringe at the idea of the “gentleman rancher,” I do think the trend is inevitable and good from an environmental standpoint. The Nature Conservancy is also a big factor in new ranch ownership...the Dugout Ranch in Indian Creek is an example. The future looks better for elk and pronghorn than it does for cattle which I think is a good thing. Ted Turner all but got a bunch of small towns ghosted buying up farms in the upper midwest. 2 million acres in 12 states and Argentina as well). Not necessarily a bad thing. Or a good thing, lots of variables. Now the bison run free and the land has come back (original grasses etc). Be interesting to see if Turner gifts it to the country as a conservation area when he passes or if it will get broken up into multiple farms again. That area has been depopulating for quite some time and the trend is likely to continue...you simply can’t keep them down on the farm when the fun and fortune allure of urban areas is so strong. Don’t forget You von Choiunard’s buffalo ranch in Sout Dakota. Check it out and order your meat from them. Someone here must know him. Ask Yvon to allow traditional bison hunts in his herd, a la the Maasai. It might help keep the buffalo hard,... stretch their legs once in a while. I'd buy a ticket to see it happen. Until then, I may be another upper middle class white person, tasting me some bison, maybe at best, eating my heart out. HermitMaster....I have a different take on urban areas. Personally, I think the more urbinization the better off the planet is. Population growth is inevitable but where you put all those people isn’t. China has the world’s largest population living in an area slightly smaller than the US. In recent years there has been a massive population shift from the country to cities. In the outskirts of Bejing and Shanghai there are hundreds of high rise apatment buildings. Even with a growing population the countryside is losing people leaving more room for the animals we share this planet with. If you’re going to have a lot of people, stack them on top of each other rather than spreading them out. Our species of “intellegent ape” seems to like it that way...gives them more opportunity to get lucky. If I was native, if I had any stones, I'd poach the sh#t out of one of his buffalo. Take the meat to people in need, maybe leave behind some of the best bits...just for the chance to meet the owner. This happened a few weeks back. I expect a couple of large riverview mansions in the area soon. I’m generally against this kind of thing. You need look no further than the vanishing family farms across the United States. This has happened due to any number of factors, including demand for cheap food (driven by falling wages since the 1970s), government subsidies for big agribusiness that fuel factory farming as opposed to traditional family farms, and general apathy amongst the American people. Personally, I think the more urbinization the better off the planet is. Jim, spot on. I believe saturation to be one of our greatest woes in civilization. So basically ruin just a little bit of EVERYTHING. Better to keep the bulk of it all concentrated. Nice meme hermit, but ignores the actual facts, urban dwellers per capita use less energy than rural dwellers. One can live more efficiently in a big city. I got to jump in here with my two cents... I know many wealthy landowners that have done fantastic thing for wildlife around the world. Many due it to turn a profit (that is fine) others spend the money to simply help out their passions and don't make money off it. My father has purchased several properties just to improve wildlife habitat. We make no money on them, but it is his passion to keep these areas away from developers. The Feds ,state and various groups often visit to gain knowledge on issues they are working on public lands. He is approaching 80 years old. His love of wildlife and trees, I believe has helped many critters. The problem is we both love the trees so much we hate to cut them. Property taxes have to be paid. That said, I don't have the money to finance his goodwill when he passes, and worry about the decisions I will have to make. And I have learned how to look at these things. I have found the line and it’s direction is known to me. A good thing? We all see our straight line as a good thing. The elk and pronghorn might see all the humans, with our hearts full of the good thing, being dead as a good thing, but that’s not the straight line I prefer to see with my human way of looking at things. I expect climate change is gonna jumble up all those straight lines anyway. Sure, agreed, take away my steaks but leave me the birds and the bees is the straight lined way that I’ve learned to look at these things too. Coincidentally, I expect that I’ll be one of the ones who gets to enjoy those birds and bees. 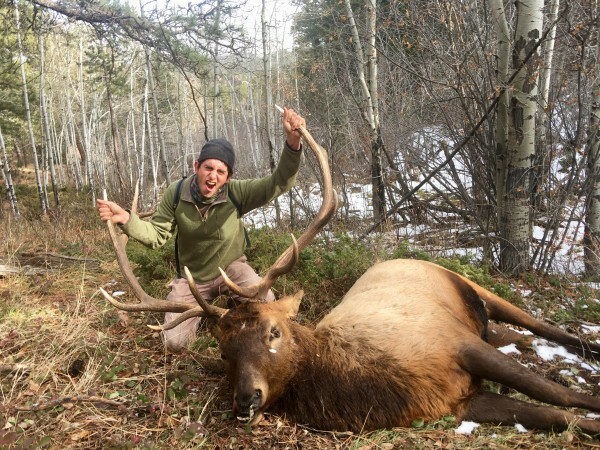 Was not young Yovon involved in poaching a deer in the Tetons? It's dirtbag lore and recounted in either Camp 4 or RR's bio. I spent the summer with the fishing guide brother who had two outdoors channels on most of the time. Lots of places cater to hunters who come to bowshoot deer on private land. Good idea, economically. You can't hardly make it farming the land anymore, so you can't blame the owners for wanting to "make a buck." Anything is better than an industrial farm. Although the rich tend to like properties with decorative crags in the backyard that people are supposed to stay off of. The private ranches can also be annoying when they block access to public land. In CO it seems like there is so much to explore but it's out of reach. Actually hunters are good at that, and buy the gps maps that keep you from getting shot to death by landowners. The eco trophy ranches might be good if we had the right to roam laws they have in Britain and Scandihoovia.